Hos Dorte: Food and/or Drink, a midway reminder for HM&FMC. What a fun and sweet card for our challenge!! Thanks so much for playing along at Double D Challenges!! OH What Fun! Your colors are great and she's going to love these adorable little guys! Thanks so much for joining in the fun at our Double D ‘Neon / Brights’ challenge! We hope you’ll come back often. Very nice shaped card. Love the image of that mouse juggling eggs. Nicely colored. Fun and whimsical!! Love it!So glad that you join the fun over Simon Says Stamp Wednesday "Happy Birthday" Challenge! It's a really lovely Easter creation and perfect for our theme, many thanks for joining us at Penny Black and More April challenge. Oh My! Such a fun image..trust the little meeces to love easter too. Gorgeous colours and such pretty embellishments too. Oh ... was für eine süße Karte. Deine Karte ist großartig! 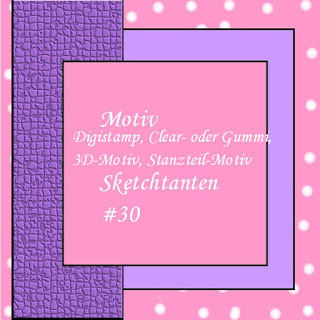 Danke für deine Teilnahme bei den Sketch-Tanten. A beautifully designed card and I like the colour combination. Thank you for entering our challenge at Penny Black and More this month and sharing your lovely work with us. Aaaaaaaaaaaaawwww, what a cute Image! And an amazing shape! Very nice creation. Wow... this is such a wonderful card. Lovely card, sweet stamp and love the zingy colours.